Custom Back Bar Displays powered by MRL Promotions can create a mat for any of your business needs. 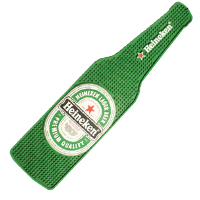 Bar rail mats and counter service mats are perfect for any bar, restaurant or nightclub. Our bar rail mats and service mats are made of thick, heavy rubber and can be molded into different sizes with a logo imprint or custom design for promotional use. Bar rail mats and service mats grip wet glassware to prevent spills and protect the bar’s surface. All of the bar mats provided by Custom Back Bar Displays powered by MRL Promotions are guaranteed to be made of exemplary materials, accompanied with exceptional service. Contact us today! Custom Back Bar Displays powered by MRL Promotions is a leading promotional advertising agency offering impeccable service and bar products to our clients. Our bottle service trays are among the most high quality and durable in the industry. All of the bottle service trays offered by MRL Promotions are completely customizable and are tailored your needs and budget. Custom Back Bar Displays powered by MRL Promotions designs and produces bottle service trays tout of acrylic, wood, or metal, and can be made in any color or size. 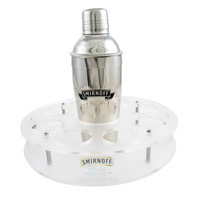 Bottle service trays can include LED illumination and lights to standout in the nightlife setting. Custom Back Bar Displays powered by MRL Promotions is dedicated to providing our customers the most innovative bottle service trays at the best price. Ice buckets are a great addition to any bar, restaurant, night club, or event. Ice buckets are used to cool beverages whether for sampling or for bottle service. 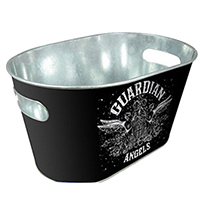 Custom Back Bar Displays powered by MRL Promotions has been manufacturing quality ice buckets for our clients for years. Our team of expert designers is experienced in providing exclusive and one-of-a-kind designs exactly to your specifications. At Custom Back Bar Displays powered by MRL Promotions, we provide an extensive range of ice buckets that vary in shape, size, and design. We never compromise on the quality of our products as our client’s satisfaction is the upmost priority. Serving trays are an essential item at any restaurant, bar, night club, or just about any event where there are food and drinks being served. Custom Back Bar Displays powered by MRL Promotions offers serving trays that are in stock or can be custom designed to any specification. Our service trays can be made into any shape, size and from wood, acrylic or metal. In addition, our serving trays can be further customized to be illuminated for any dark venue. 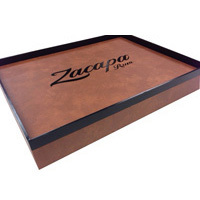 All of the serving trays we provide can be custom printed with your logo or graphic. Embellishments such as handles, non-skid cork liners, and imprintable outer sidewalls further add to the customization of our serving trays. Contact Custom Back Bar Displays powered by MRL Promotions today to get your next order of serving trays started.